The red spined Cumulopuntia boliviana subsp. ignescens (right) grows in close association with Maihueniopsis conoidea, a local form of Maihueniopsis glomerata. Altitude range: The species is common at altitudes 3500-4700 meters above sea level. 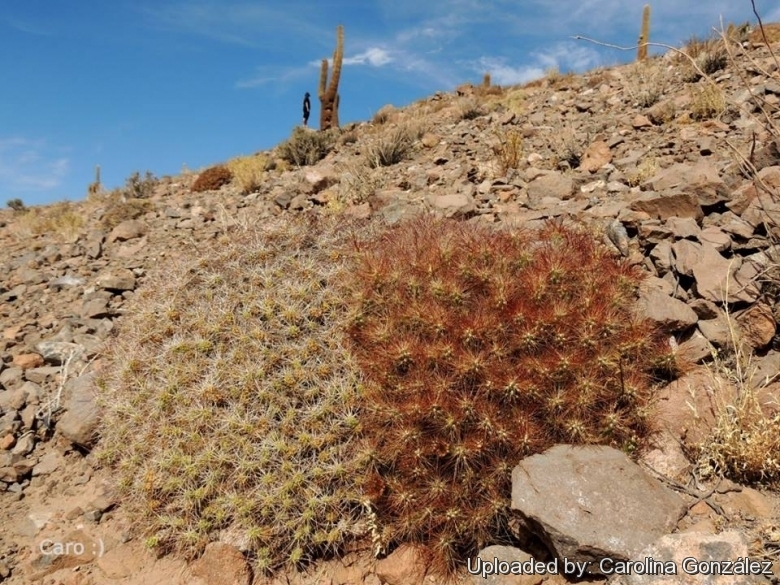 Habitat and ecology: Cumulopuntia boliviana subs. ignescens grows in high altitudes close to the line of high Andes. It is present in areas fully exposed to the sun, generally in areas or slopes facing north. It never occurs on rocks, but rather on sandy grounds in close association with the local form of Maihueniopsis glomerata. Exceptionally, wild and domesticated New World camelids forage on this species. It reproduces by seed and spreads vegetatively by means detached joints or cladodes, which can take root and establish themselves as independent individuals. 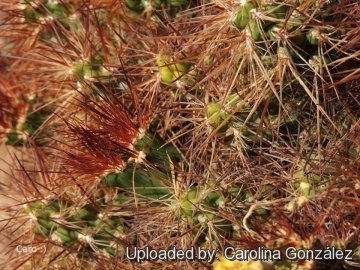 Description: Cumulopuntia boliviana subs. ignescens (Cumulopuntia ignescens) is one of the varieties of Cumulopuntia boliviana which is a somewhat variable taxon with several collected extreme forms that were early published as full species or as varieties, but these were too weak botanically to stand, so they are all combined in Cumulopuntia boliviana. It forms a dense and sometimes swollen, dense, spiny cushion 30 to 60 cm in diameter, distinguished from the type for its long, brownish-red spines. Derivation of specific name: Latin 'ignescens', present participle of the verb 'ignescere' to become inflamed, on fire, from 'ignis' fire. The specific epithet alludes to the characteristic red colour of the spines and of the flowers. Stems (joints): Up to 9 cm long and 4 cm in diameter, strong, oval, apex more or less conical and pointed with noticeable tubercles in the upper part. Some of them are strong, others thinner. Areoles: About 15 the basal ones small spineless, the upper ones located on the top of the joints larger and spiny. Spines: About 20, arising only in the upper areoles. Erect, reddish brown, dark with age, very crowded, up to 10(-26) cm long. Glochids straw yellow 3.5-5.5 cm long. Flowers: Red to orange-yellow up to 3.5 centimetres long. Fruits: Fleshy, finally dry and pulp-less, barrel-shaped filled with numerous spines up to 6 centimetres long on the edge. Cultivation and Propagation: Cumulopuntia boliviana subs. ignescens cannot endure any standing heat and need an absolutely airy and sunny place this brings very healthy plants with a good spination and flowers, but often in cultivation the plants are rarely so compact as they are best grown inside a greenhouse because of our very humid weather in North Europe and America which gives a relatively low light intensity compared to the temperature. However, this species takes considerable frost and is certainly worth growing.